Here's something to gnaw on this Memorial Day weekend. 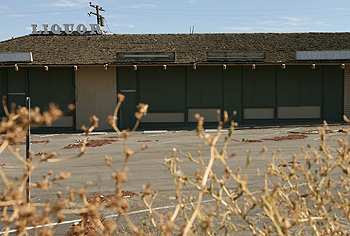 Last Tuesday, May 20th, saw our City Council consider a request from the current owners of the derelict El Camino Plaza to extend for another year their entitlements to redevelop that blighted block smack in the middle of Mesa Del Mar. Their spokesperson was a sharp gentleman named Steve Sheldon, President of The Sheldon Group. I watched the exchange of questions and answers and the public comments. I noticed that Mayor Eric Bever and Mayor Pro Tem Allan Mansoor were taking the lead in support of the request. I didn't give that too much thought, although I do recall thinking that Mansoor was taking a pretty soft position on a project that has been plagued by delays for years. Eventually, after Sheldon promised that the structures on the site would be completely demolished by June 19th, the council agreed to the staff recommendations. SOMETHI NG FISHY GOING ON? But something kept nagging me - it just didn't smell right - so I did some research and find that Sheldon's organization was a major participant in Mansoor's reelection campaign two years ago. If fact, just a year ago they helped him put on an event which was disguised as a fund-raiser for the Veteran's Memorial Project but was, in fact, a fund-raiser for Mansoor. I wrote about that in a post on this blog on May 30, 2007, which is still available for viewing in the archives over on the right side of this page. Further nosing around has led me to some sources that indicate The Sheldon Group may be an active member of Eric Bever's re-election campaign. Here's my question for you: Is it appropriate for a consultant, who supported (that means he was paid to support) Mansoor's re-election effort and subsequent fund-raising and may be currently involved in Bever's campaign, to stand before the council as a paid spokesperson for a project with lots of money to lose if the vote goes the wrong way? I know this probably doesn't meet the threshold for conflict of interest violations under our municipal code, but it sure does have a peculiar odor to it - especially when you consider the subterfuge of Mansoor's fund raiser last year. It seems to me that Mansoor and Bever should have excused themselves from the discussions and vote because they have a financial relationship with The Sheldon Group. What do you think? Conflicts of interest on the city council with developers? Gee, where have I heard that before (OK, it was planning commissioners, but still...)? Geoff, nice catch, and I hope you stay on top of this story. I'll just say that where there's smoke...sorry, I couldn't resist. Happy Memorial Day to you! Sheldon wants a moratorium on the project because of the current housing market! The developers would lose their shirts if the project were not allowed to be put on hold for another year.